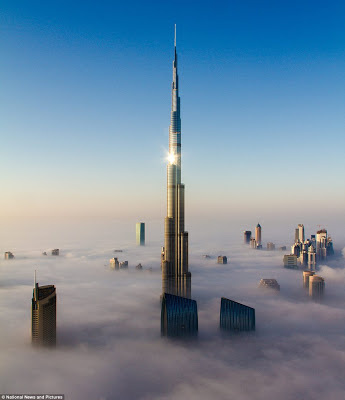 These pictures were taken by German photographer Bjoern Lauen, who went up to the top of another building to capture the Burj Khalifa in Dubai, the world's tallest building, in the central business district at sunrise. Mr Lauen, who has lived in Dubai since 2005, added: 'It is a bit of a challenge for motorists on Dubai's roads and a rare natural spectacle for the very early riser. 'During those few moments before, Downtown Dubai, with Burj Khalifa...is covered under a blanket of white. Standing at more than 828 metres (2,716.5 feet) and more than 160 stories, the Burj Khalifa is also the tallest free-standing building. That's 1,000 feet taller than the second tallest structure in the world, Shanghai World Financial Center which equates to almost a doubling of height. Now that is my kind of tall. Taller, further, faster, more beautiful, more efficient. That is what human beauty and spirit should be. Unfortunately, how much of all the underbelly, the truly repugnant aspects of the species of man were substantially used to create this one item of exquisite perfectness and beauty. Was it worth it? I say yes and yet I'm also ashamed of how much harm we do to our world.